For many Austin College alumni, memories of January Term stand out as highlights of their college years. During the month-long term, students take only one course so have the opportunity to focus on a special interest or try something new, bring areas of study to life through walking the streets, or complete internships that may shape their career directions. On campus, the atmosphere is different than during the fall and spring terms. With only one course to prepare for, the pace is a little slower. Many students, including most freshmen, remain on campus so have a bit more time to “chill” with friends and become better acquainted with fellow students. Of course, for many, the best part of JanTerm is the opportunity to see the world. This January, more than 200 students were enrolled in courses that involved study outside the country, bringing their subject matter to life and experiencing their learning. Don Rodgers, associate professor of political science, and the 22 students in his course, “Taiwan’s Political Environment,” didn’t just read about politics; they experienced daily life on the island. The course included meetings with government officials, representatives of Taiwan’s major political parties, university professors and students, and NGOs. Discussions covered Taiwan’s domestic political processes, major social issues, foreign policy and relations with China, and economic development strategies. 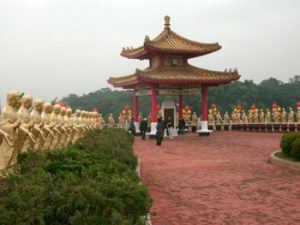 The trip was centered in Taipei, the seat of government and Taiwan’s commercial center, as well as one of the world’s most lively and interesting cities with fantastic restaurants and nightlife, beautiful temples and monuments, night markets, parks, museums, and Taipei 101, the world’s 2nd tallest building. The trip also included visits to other major cities and some of Taiwan’s most famous scenic and cultural areas including Taroko Gorge, Yushan (Jade Mountain, the highest peak in East Asia), the Wulai Aboriginal Village, Yangminshan Hot Springs Resort, Sun Moon Lake, and the beautiful northeast coast. Ten other courses included international destinations, with students traveling to Argentina, China, Costa Rica, England, France, Guatemala, Italy, Morocco, Spain, and Turkey. Courses also involved travel to California, Florida, and New York.